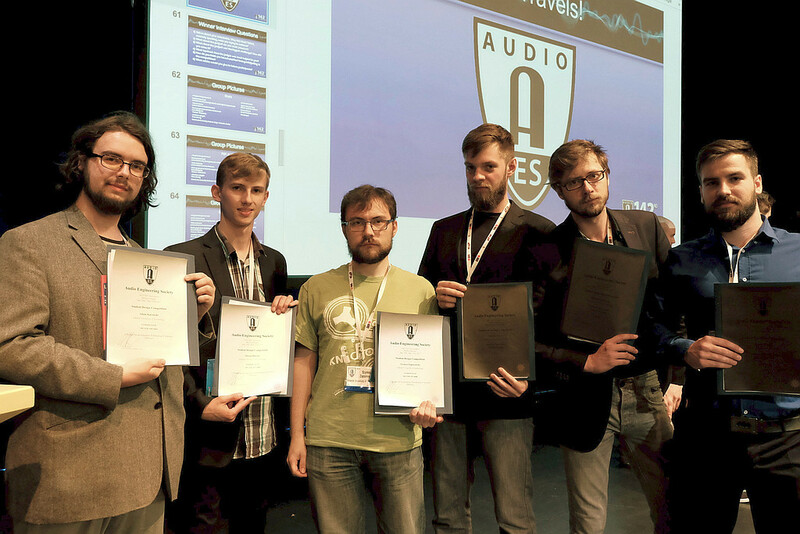 A group of undergaduate and PhD students participated in the 146th Audio Engineering Society Convention in Dublin. As part of the convention, a vote was held for the position of vice-chair for Europe and International Regions in which B.Sc. Kamila Pietrusinska was elected. Kamila will hold office in the Student Delegate Assembly for the next two years (the first year as a vice-chair, the second as a chair) representing the Department of Multimedia Systems on conventions in Europe and the United States. 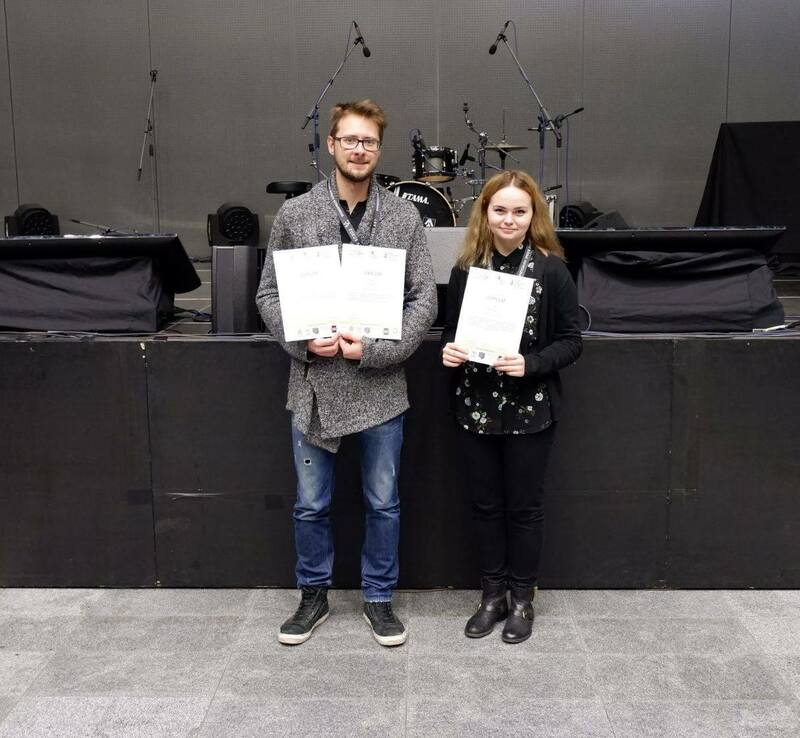 The Polish Nationwide Student Conference of Acoustics that held the OSKArec contest closed on 09.03.2019. Two of our students were awarded in the contest: B.Eng. Kamila Pietrusińska won second place in the Sound for Visual Media category and M.Sc.Eng. Damian Koszewski won the 1st and 2nd place in categories Studio Recording and Remix, respectively. Brain and Mind Electrophysiology Laboratory is a new unit within Multimedia Systems Department. Michał Kucewicz, Ph.D., is the head of the Laboratory. We invite you to visit the Laboratory web site: brainmindlab.com. 22th IEEE Signal Processing Algorithms, Architectures, Arrangements and Applications (SPA) international conference took place on 19-21 September 2018 r. in Poznań, Poland. Six papers were presented during this conference by the Multimedia Systems Department staff. 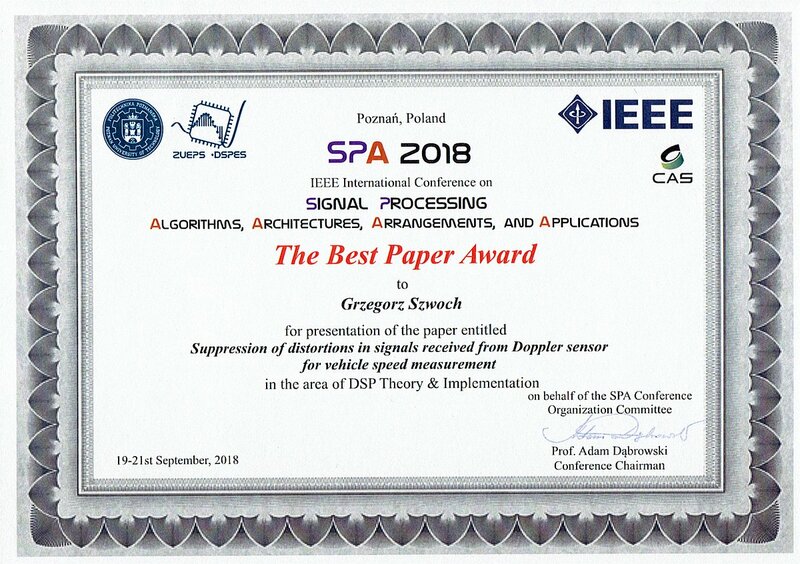 The paper Suppression of distortions in signals received from Doppler sensor for vehicle speed measurement, by Grzegorz Szwoch, received The Best Paper Award in the area of DSP Theory & Implementation. It is with deep regret and profound sadness that we announce the passing away of Prof. Marianna Sankiewicz, the co-founder of our Department. 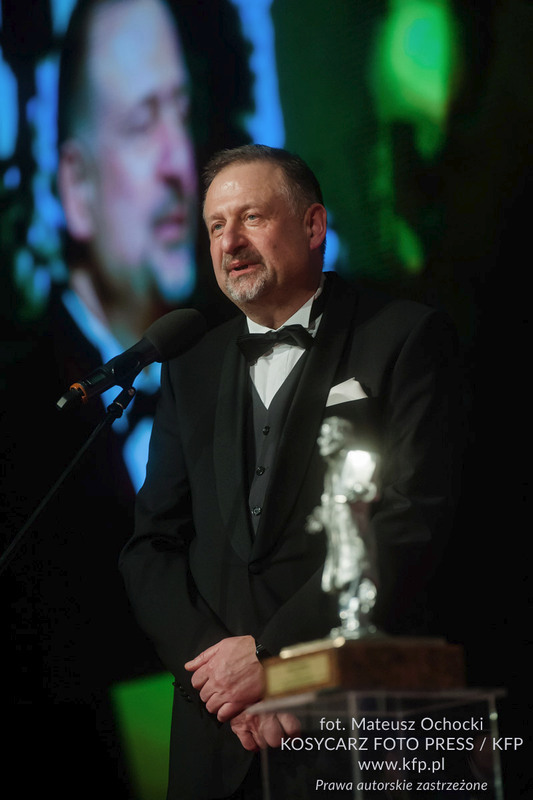 Prof. Andrzej Czyżewski, head of the Department of Multimedia Systems, GUT, was awarded with Primum Cooperatio prize by the Pracodawcy Pomorza (Pomeranian Employers) organization. The Primum Cooperatio (Cooperation First) prize is awarded for promoting cooperation between representatives of science and industry. 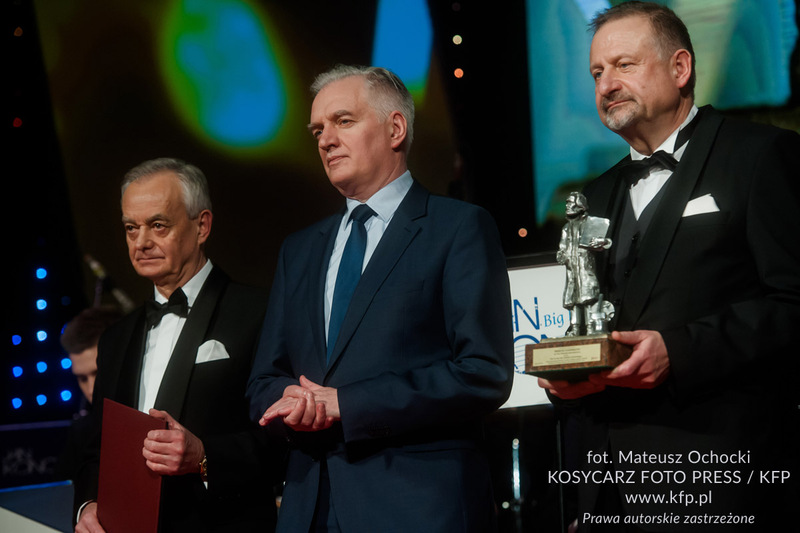 The prize was handed by Polish Minister of Science and Higher Education, Jarosław Gowin, during the Gala Evening on 26th January 2018. Karolina Marciniuk, a PhD student from the Laboratory of Audio Acoustics, Faculty of ETI (Gdansk Univ. 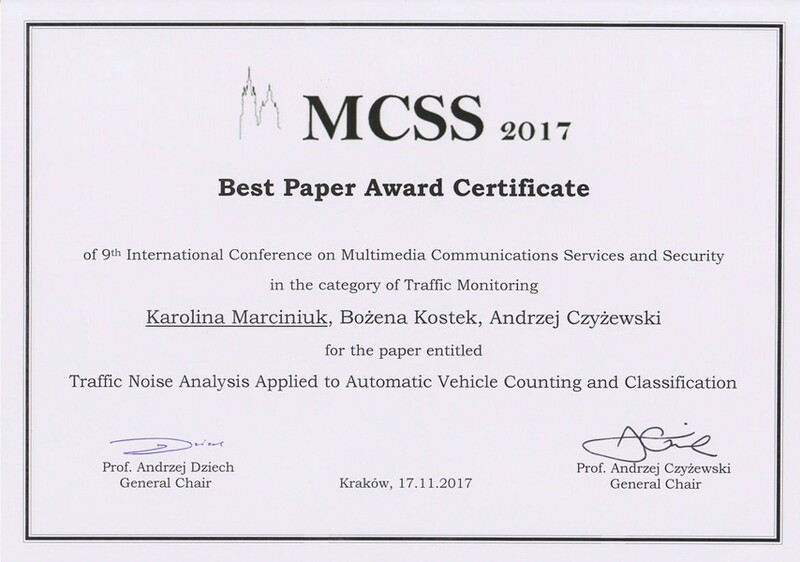 of Technology) received the best paper award in the category of Traffic Monitoring for presentation Traffic Noise Analysis Applied to Automatic Vehicle Counting and Classification. Paper was co-authored by Prof. Bożena Kostek and Prof. Andrzej Czyżewski. Conference took place on November 16-17, 2017 in Cracow. 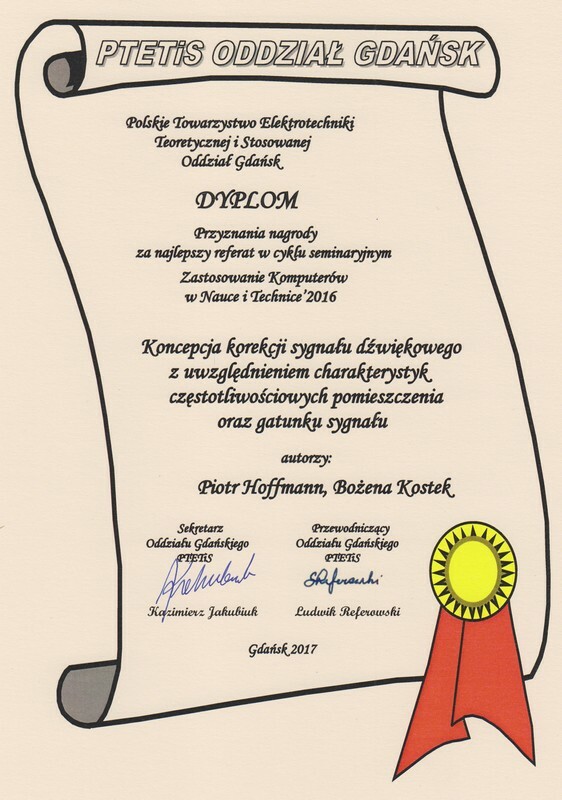 On October 3rd, 2017, at the seminar of the Polish Society of Theoretical and Applied Electronics, the best paper award of the Application of Computers in Science and Technology 2016 seminar series was given to Piotr Hoffmann (Ph.D student) and Professor Bożena Kostek from the Audio Acoustics Laboratory, Faculty of Telecommunications, Electronics and Informatics of the Gdańsk University of Technology for the paper entitled A sound signal correction concept taking into consideration the frequency characteristics of the room and the signal grade. The international conference on Medical Image Computing and Computer Assisted Itervention (MICCAI) was held on 10-14 September 2017 in Quebec City, Canada, in conjunction with the Computer Assisted Robotic Endoscopy (CARE) Workshop. 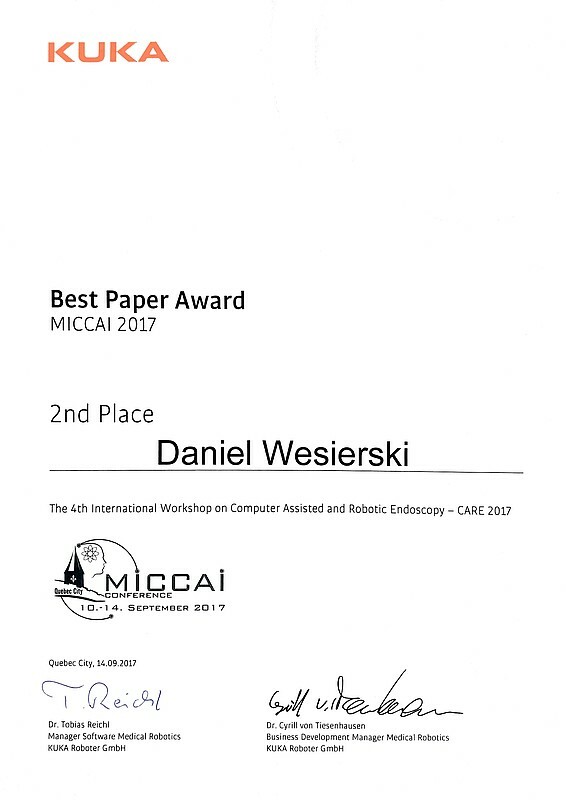 Our conference paper at CARE 2017, Shape-based pose estimation of robotic surgical instruments by Daniel Węsierski and Sebastian Cygert, received the2nd Place Best Paper Award. 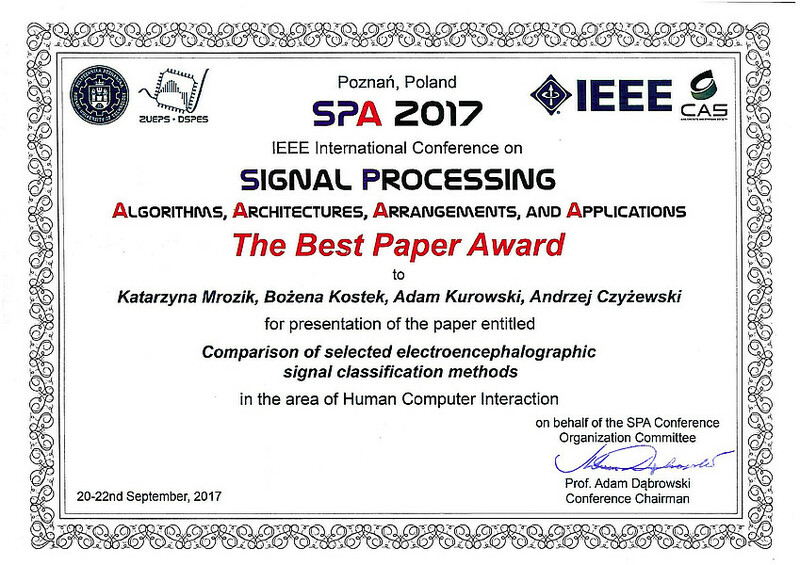 An international conference Signal Processing Algorithms, Architectures, Arrangements, and Applications (SPA2017) took place in Poznan, 20-22.09.2017. 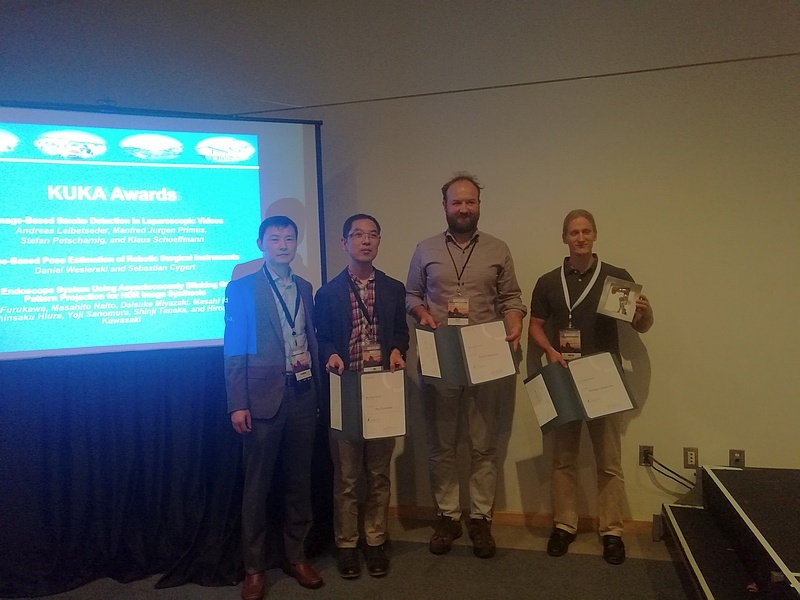 The paper entitled Comparison of selected electroencephalographic signal classification methods, presented by Adam Kurowski and prepared by the team of: Katarzyna Mrozik, Adam Kurowski, Bożena Kostek and Andrzej Czyżewski, received The Best Paper Award. 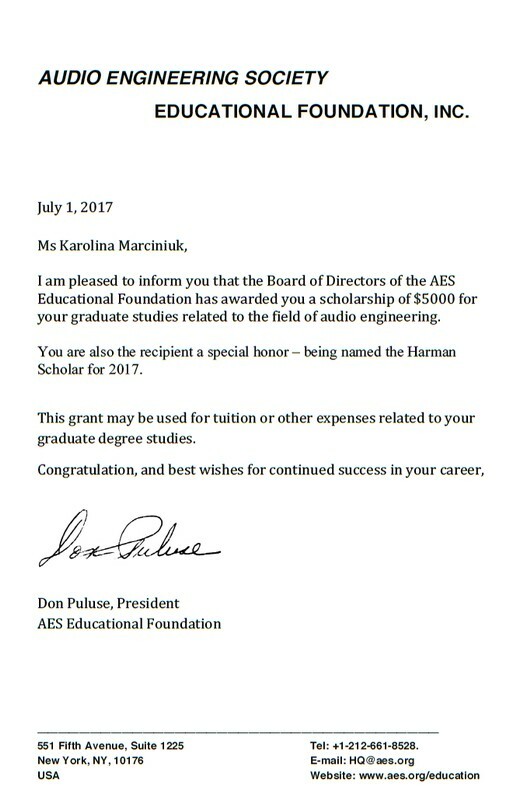 Karolina Marciniuk, a PhD student from the Multimedia Systems Department and Laboratory of Audio Acoustics, was awarded the 2017 Audio Engineering Society (AES) Educational Grant. She is also a recipient of a special honor, i.e. Harman Scholar for 2017. The grant was founded by the Harman International Industries. On May 20-23, 2017, students from Multimedia Systems Department took part in the 142nd International Convention of Audio Engineering Society held in Berlin. During the Convention, two students contests were organized: Recording Competition and Student Design Competition. There were two contest entries in both categories. In the first one, a group consisting of Damian Koszewski, Mateusz Gnys and Dustin Hartka were awarded a bronze medal in Sound for Visual Media category. In the Design contest, the silver medal was awarded to the team of Adam Kurowski, Maciej Blaszke and Szymon Zaporowski. In addition, student Dawid Weber got an award for the best photo of the Convention. 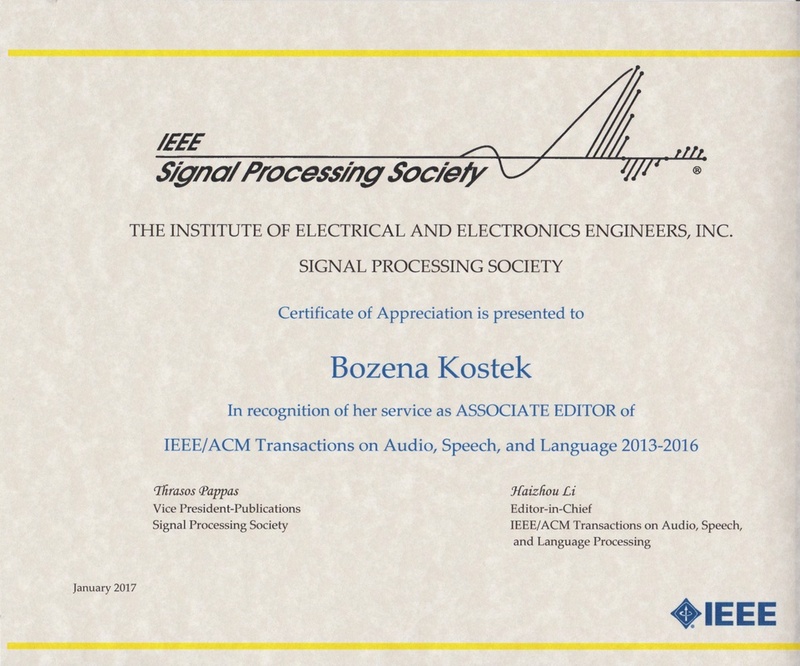 Prof. Bożena Kostek (Audio Acustics Laboratory) has received the Certificate of Appreciation in recognition of her service as Associate Editor of IEEE/ACM Transactions on Audio, Speech, and Language Processing (2013-2016). It is with deep regret and profound sadness that we inform you of the passing of Andrzej Kaczmarek, a former member of our Department staff. Andrzej Kaczmarek received his M. Sc. 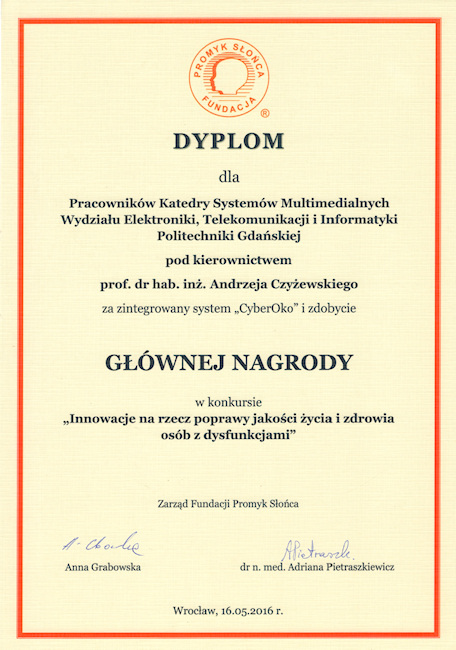 degree in Automatics and Computer Science from the Technical University of Gdansk in 1972. He worked as a specialist of computer services up to 1975 in the ELWRO-Service (Wrocław). That year he changed his work and returned to Gdansk. 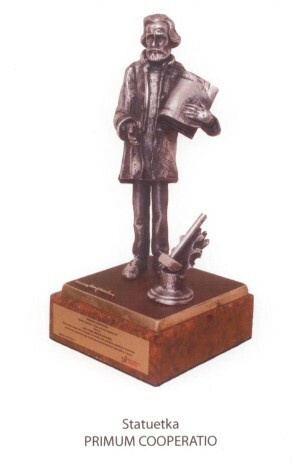 He acted as a designer and a constructor of computer devices in the Ship Building Department at the Technical University of Gdansk. Then Andrzej Kaczmarek joined the staff of the Sound Engineering Department in 1985. His research interest was focused on computer analysis of musical sounds (especially pipe-organ sounds). He received his Ph.D. degree in 1995 in this subject. His interests were also focused in applications of audio engineering to speech recognition (speaker recognition), analysis of pathological speech and sound restoration. He used in his research machine intelligence algorithms such as neural networks, fuzzy logic and rough sets. Andrzej Kaczmarek has published a large number scientific papers in journals and at conferences. He participated in a number of scientific projects. He is a co-author of youarchive.net and many algotirhms and programs developed within PRESTOSPACE, INDECT, SYNAT and MODALITY projects. He was also a teacher in numerous classes, many of which were designed by himself. The memory of Him will always remain in our hearts. The 16th International Symposium on Innovations in Audio and Video Technology took place in Rzeszow, October 13 to 15, 2016. The paper presented by Adam Kurowski and co-authored by Karolina Marciniuk, Adam Kurowski and Bożena Kostek, entitled: Analysis of soundscape recordings in close proximity to the road in changeable weather conditions was awarded the first prize for the presentation of the paper by the young researcher by the Presidium Board of the Polish Section of the Audio Engineering Society. 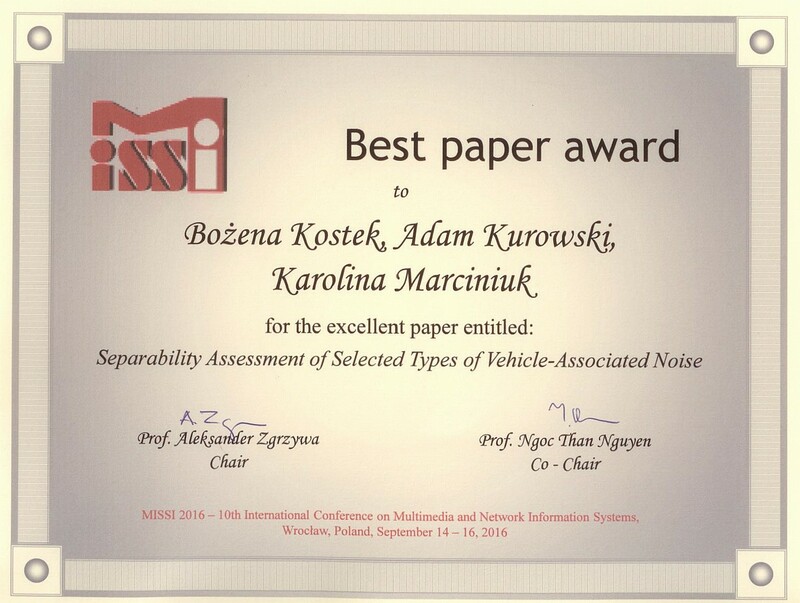 Prof. Bożena Kostek, Adam Kurowski and Karolina Marciniuk received a Best paper award for the paper entitled: Separability Assessment of Selected Types of Vehicle-Associated Noise during MISSI 2016, the 10th edition of International Conference on Multimedia & Network Information Systems conference which took place in Wrocław, 14-16 September 2016. The jury of the contest "Innovations to improve the quality of life and health of people with disabilities," recognized the "CyberEye" system as the most innovative among of the submitted proposals. Many candidates, both companies and individuals, competed for the title of the most innovative solutions that helps enhance the quality of daily life for people with disabilities. All solutions stand out unconventional and creative approach to the subject of improving the functioning of people with different kinds of disabilities. 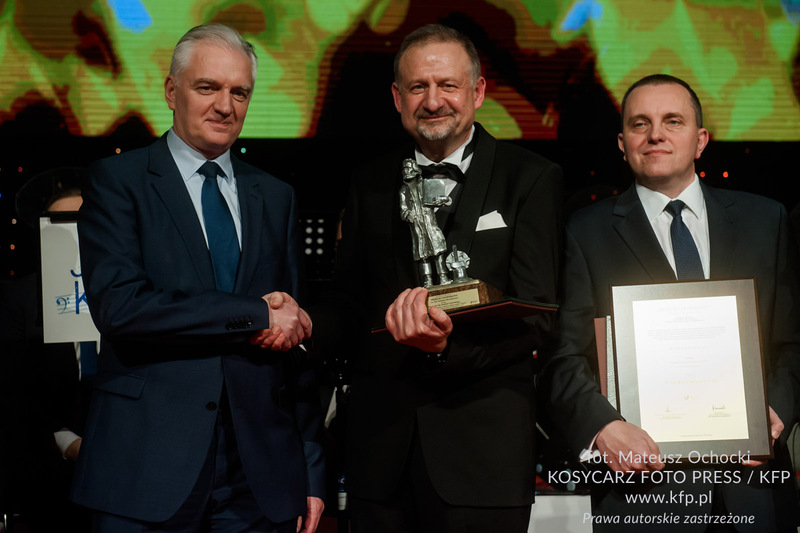 On behalf of the creators of the "CyberEye" , prof. Andrzej Czyzewski received the award during the conference "Assessing and supporting the psychomotor development of a child" that took place on 16 May 2016. 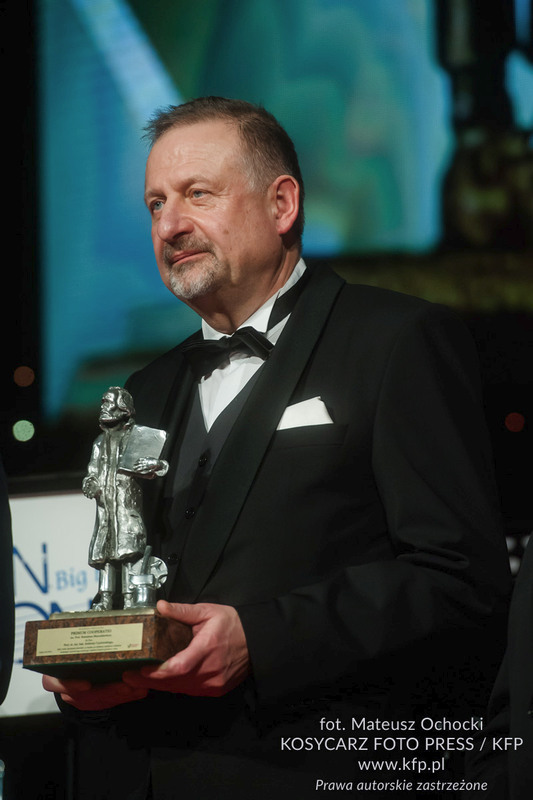 The 138th Audio Engineering Society Convention took place in Warsaw, May 7 to 10, 2015. The Convention hosted 1500 participants from Poland and around the world. One of the events organized for students was the Student Design Competition which attracted many interesting projects. 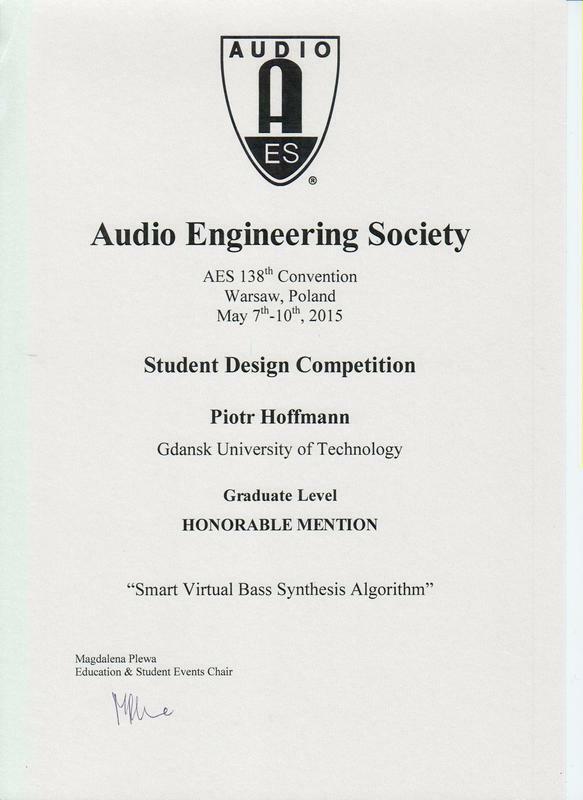 Piotr Hoffmann, a Ph.D. student from the Multimedia Systems Department, presented a project devoted to automatic control system of virtual bass synthesis audio modification depending on music genre, the so-called Smart Virtual Bass Algorithm. The project has been awarded a prize: it received an honourable mention. For older information see the Archive.